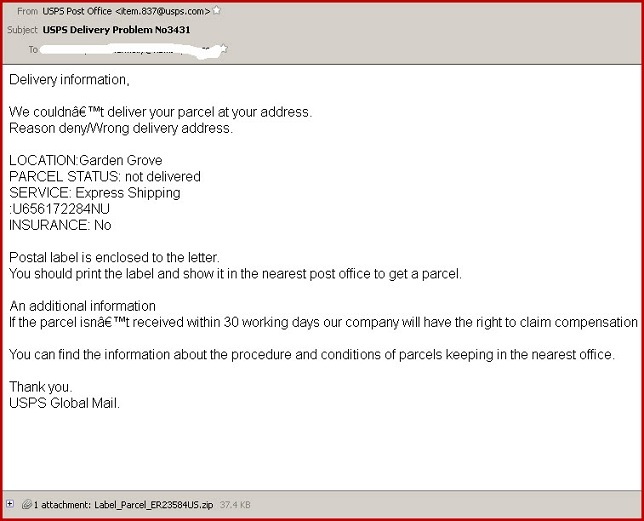 UPS/USPS SCAM ALERT – This particular scam is doing its rounds again. The latest email scam alert concerns emails that purport to be from UPS or USPS. These emails contain a particularly nasty Trojan virus which, once on your pc can lead to identity theft and leaves your home pc or laptop open to hacking. The subject line of the emails contains a false UPS tracking number and the message body, supposedly from the United Parcels Service, states that they were unable to deliver a parcel due to a wrong postal address. There will be an attachment with the email which it says is a copy of a waybill, invoice or postal label for you to print and use to collect the parcel from the UPS parcel office. However this attachment, which is a compressed zip file, contains a Trojan. If you try to open the attachment, this virus will infect your computer. The attachment is a compressed ZIP file (“.zip”), even though the icon may look like a Word document. The virus installs a downloading program which then fetches and installs at least two more files on your system. These files could disable your firewall, look for and steal credit card and bank account details, make screen snapshots and could allow hackers continued access to your machine. If you do get the email, just delete it. It shouldn’t cause any harm, provided you don’t click the attachment. Omniquad has issued a warning advising people not to open attachments sent by UPS or USPS.In fact email attachments should always be clarified with the company or person who sent them before you attempt to open them, even if you regularly deal with them. There are millions of people who use UPS and who may well be tempted to open such an attachment so always ensure that the email is safe first. You can do this either by telephoning the company or person and confirming that they sent the email, or by hovering over any link to see which URL address comes up. Email phishing scams are getting ever more convincing so it pays to stay alert and invest in some email security which will prevent any such threats from reaching you in the first place. Prevention in this case, is much cheaper than the cure. If you have already clicked on the attachment, and your computer is infected, disable system restore, boot your computer into safe mode, update your virus definitions and then run a full system scan. UPS has issued a warning telling customers not to click the attachment. UPS points out that although they sometimes send out email notifications, they rarely uses attachments. You can read the entire message from UPS on their site.